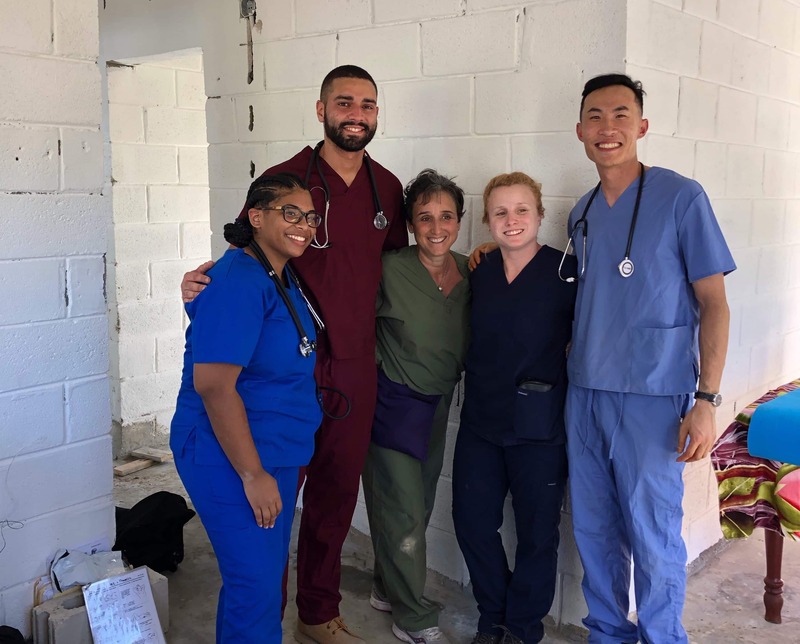 Four students in the Rutgers School of Health Professions physical therapy program spent winter break splitting their time between helping patients in a small Dominican Republic village manage their pain, and doing construction on a sustainable, hurricane-resilient home. The service trip, which brought together students from four New Jersey colleges and universities, was organized by Rutgers DPT alumna Beth Rothman, who has created a non-profit called Physical Therapists Beyond Boundaries to bring physical therapy services to countries in need. The four Rutgers SHP students on the service learning trip were Alexander Olan and Khadijah Callahan, PT North, and David Lin and Christine Gaul, PT South. In the mornings, all of the students, working with the U.S.-based nonprofit Cambiando Vidas, helped to do construction work for the house, including cinderblock brick-laying, building door frames, windows, and roof ceiling, tiling the kitchen and bathroom, laying the concrete floor, and painting the finished home. In the afternoon, PT students participated in physical therapy clinics set up by Dr. Rothman. In one clinic, set in a partially completed house, which another non-profit started but didn’t complete, families and their children, older adults, and farmworkers with work-related injuries who could not afford to make the trip to the local city for treatment, came for pain management and relief. Students also accompanied Dr. Rothman and local Dominican therapists on a homecare evaluation visit, spending their final day in a small non-profit rehabilitation center in the city of San Juan de la Maguana, a few miles away from the rural village of Los Cerros where they were staying. PT Beyond Boundaries aims to expose American students to the idea of treating patients in non-traditional settings with no equipment, as well as have them work side-by-side with local therapists in order to enhance the local therapists’ skills through exposure to more highly trained students. The four Rutgers students were joined in their nine-day stay by students from Union County College physical therapist assistant program, Rutgers Law School and The School of Public Affairs and Administration. “Everyone was super grateful and appreciative for what we did,” he said. The trip marked the eighth time Rutgers students have joined Rothman on service learning visits. “I am incredibly gratified by the enthusiasm, skills, dedication to the profession and comfort with patients exhibited by the students who participated,” said Dr. Rothman, who looks forward to doing another trip with Rutgers in the future.